We've got the ocean, got the babes Got the sun, we've got the waves --Best Coast, "The Only Place"
The notion of writing on my patio in February seemed a fantasy for six years of my life. Living in Portland, Oregon, February was most dreary, dark, lonely and bone-chilling cold. One year was so particularly miserable that we had a "Heat Wave" party replete with beach balls, sand, palm trees and towels in an 750 square foot apartment with the thermostat turned to 85 degrees. We wore bikinis and swim trunks drinking fruity cocktails with paper umbrellas watching the windows fog and the sweat bead. I now sit perched atop my hill in Marin County, California sporting a tee shirt staring at 150 year old palm trees and listening to the hummingbirds buzz not 5 feet from the milk crate on which I sit. I write long-hand, my preference as a professional cursive-maker, unable to shackle myself to my large desktop inside; my drafting table a forgotten mess. In Portland, February would be a most productive time. Unable to venture out, all one can do is stay warm and create. Yet I persevere in my new sun-drenched existence. I must not allow the sun temptress to flirt with me, cajoling me to play with her. Custom Ketubah commissions await; projects in various stages of development must be completed and sent out to their respective clients. Etsy orders need to be filled. Thus I bring the flora and fauna of my new land to the Art Nouveau Leaf and Vine Ketubah I created recently for a wedding in Lake Tahoe. Forging a new identity in a new land. Thirteen years ago I created a ketubah for a close friend. Knowing I knew Hebrew calligraphy and could draw, he asked me to use my artistic license and create a piece of art for their traditional Jewish wedding. Word spread and suddenly I had a new career for myself. 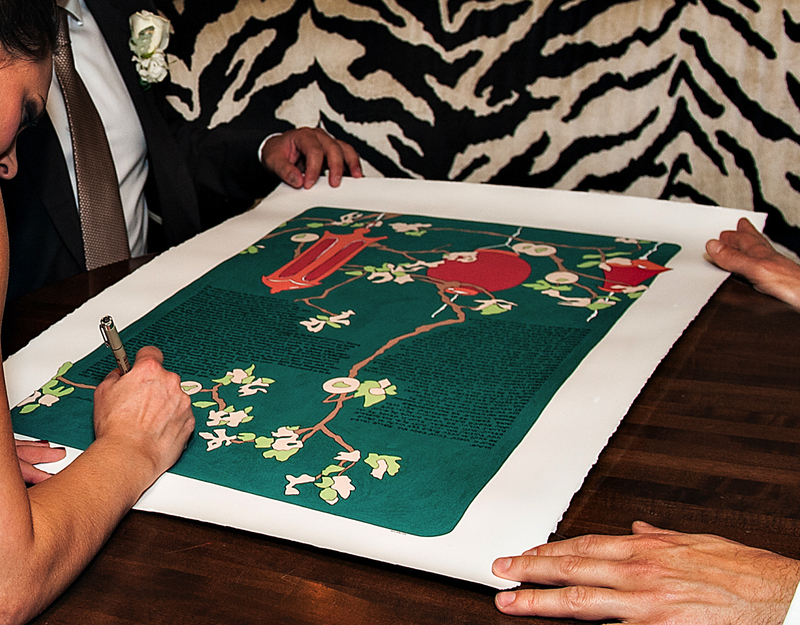 Never have I fully explained exactly what a ketubah is. So here it goes. The ketubah is a marriage contract that the groom is required to give the bride spelling out the husband’s obligation to his wife. Originally, it was considered so binding that a couple whose ketubah had been lost was forbidden to live together until a new ketubah was written. Although the ketubah is not mentioned in the Torah, the first reference to a deed associated with a Jewish marriage ceremony is the 5th century BCE. Written in Aramaic, the spoken and written language of the period, it specified that a groom must provide his wife with “food, clothing, and necessities” and entitled him to her earnings. It protected her from arbitrary divorce and guaranteed her alimony. In the Middle Ages it was standardized and used throughout Central and Western Europe. In 1492 after the Spanish expulsion, the Jews who resettled made slight departures from the standard text by adopting local customs. When Israel was established, ketubah text was standardized. During the 1970’s, illuminated ketubot experienced a resurgence that has continued, not only among Jewish couples, but among others who wished to have a custom written document celebrating their marriage. Many couples commission ketubot with traditional language using both Aramaic and English while others choose their own special vows. 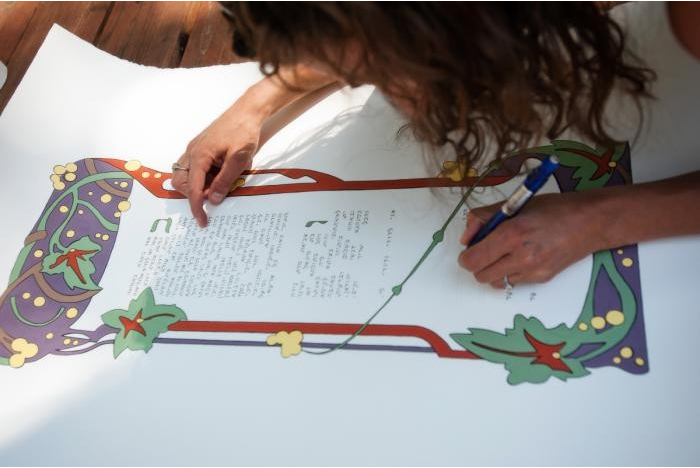 Pictured is my Art Nouveau ketubah. Last evening I watched the Paris fashion week slideshows. The Alexander McQueen collection blew me away. Haute couture steampunk neo-industrial goth fashions graced models with oversized shiny black lips reminiscent of the piles of tires that lay scattered atop the stage. An apocalyptic post-millennial celebration of black and white, the fashions, while not wearable by the likes of most, spoke to the current sense of global economic meltdown. Spectacular. Thus, in honor of beautiful fashion, I present "The Black and White Taxi Service" notecard sets. A hand-painted, hand screenprinted, original illustration, they are available in sets of 6 on 100% recycled paper with matching envelope. Perfect for the fashionista and available through my Etsy shop. And packing continues despite the ever-increasing list of reasons I find not to, including setting up a new Facebook Fan Page. If you are on Facebook, you can now fan me by clicking here and receive updates on all things Octavine: amazing links, bohemian musings, sales and incredible DIY projects will be exclusively available to all fans. The housing hunt is over. I (along with Belle, the mastiff-lab, my husband, and my new roommate, the Professor) will soon be living in the most gorgeous little 1889 Victorian. I could not ask for more. Packing boxes and cleaning closets seem rather insignificant knowing my new residence is everything I could hope for. Surrounded by an enormous lush Oregon garden my summer afternoons shall be spent drawing in the sun and picking strawberries, kiwi, raspberries and grapes. Barbecues shall abound and Belle can run around like a wild monkey. My anxiety assuaged, I am packing up shop. Treasures abound as chaos ensues. I found this painting recently; it had found itself behind some supplies. 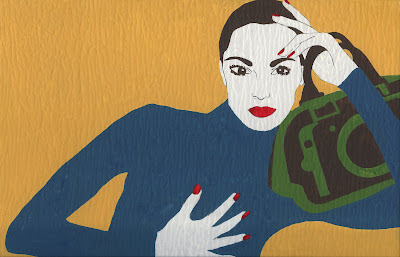 She is "The Catalog Model" and was based on a Louis Vuitton advertisement I found in the New York Times.